We established and tested a new method of precise debris-flow dating using an existing model of wood formation (Deslauriers et al. 2003). 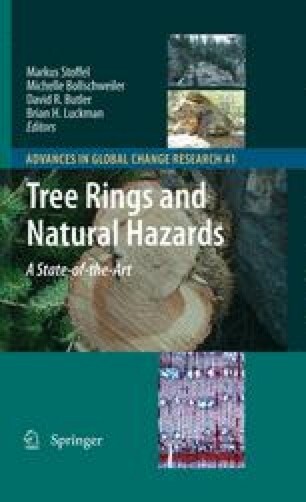 The study was based on the hypothesis that scars and other wood anomalies record the stage of tree-ring development at the moment when a high-energetic impact kills the cambium, stopping further cell production. We also assumed that tangential rows of traumatic resin ducts and wood density fluctuations within the growth ring could develop soon after injury. Debris-flow sampling was carried out at four different sites located in three valleys of the Monts-Valin, north of the Saguenay River (48°40¢–49°00¢ N, 70°00’–71°15¢ E), Québec (Canada). Fifty balsam fir (Abies balsamea) trees with scars dating back to 1996 were selected from a collection of 240 discs representing 12 debris-flows sites (Kaczka and Morin 2006). Major debris-flow events were recorded in the Saguenay region in 1996 as a result of severe rainstorms lasting from July 18–21 (199–202 Julian days). That known event was used to estimate the synchronism of three different proxies used in dendrogeomorphology to date debris-flow incidences, namely: (i) scars, (ii) tangential rows of traumatic resin ducts and (iii) density fluctuations.